Adventures with a Salmon rod: Off the mark! 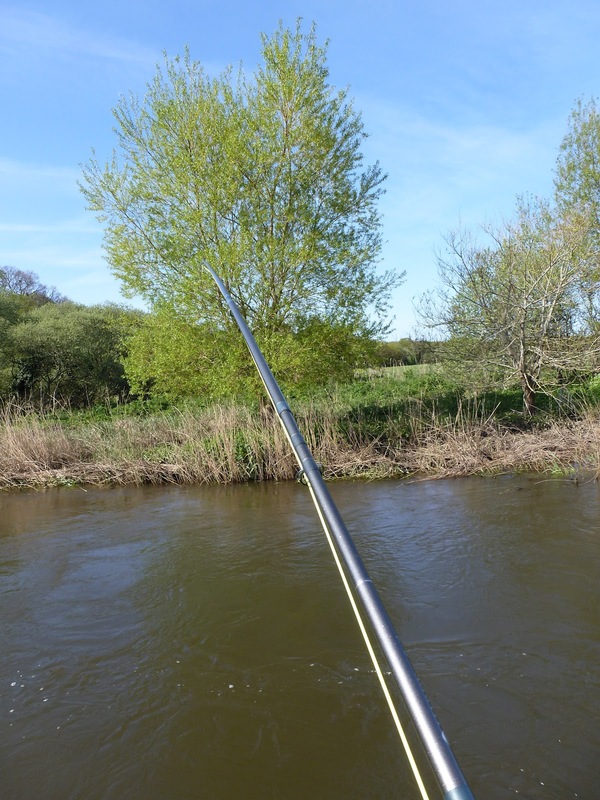 Despite the high water conditions over the last few days i kept a close eye on the river levels going that the water may drop and clear enough to make it fishable this morning. I woke early and was pleased to see it had dropped to 1.13m on the gauge at East Stoke. I arrived at the river at 8 and tackled up in the hut and had a coffee whilst i decided on fly and line options. I went for a fast sinking tip on the Rio Multi tip in combination with a 1 1/2" Cascade brass tube. I started at the top of the beat and had a good take at the tail of the the first run i fished down. Very quickly i realised it was a Pike of about 6lb. Although a good fight on the 8 weight it was not what i was hoping for. Poppy, however, was thrilled and very excited by the whole affair. Once un-hooked I continued to fish down stream, other than a couple of sharp tugs there was no major excitement although the water looked great and at a perfect height for fishing the fly. Once I got below the hut pool I stopped for a quick bit of breakfast then fished through what I thought would be the most promising spot. Unfortunately nothing happened so I fished through a nice little run leading in to the best Sea Trout pool on the beat. Just as I got to the tail of the run the fly stopped and I felt that classic jagging on the line. This was clearly a decent fish, it kept deep and ran up the run hugging the bottom , as it passed me I saw a glimpse of a spade of a tail as it made its way up to the top of the run. Poppy was very excited at this point and was looking at me wondering what my game plan was. After a few runs the fish was starting to tire although it was still heading for the open pool above. I had to put the brakes on fairly hard to keep it in the run. Eventually I got the fish under control and managed to get below it as it surfaced on its side on the surface and the game was over as I lifted a lovely 15lb bar of silver complete with sea lice out to unhook it. After a quick couple of pictures I got in the river to release the fish. After about 5 minutes it it had recovered well and swam off strongly. I spent the rest of the morning fishing down the rest of the beat but wasn't really concentrating as I was was more than happy that id just released my first springer of 2012!